How Can You Have MORE to Declutter? How can I have more to declutter? Easy. According to the TED video featuring Graham Hill that Colleen posted on Saturday, the average American house is now three times larger than it was 50 years ago, yet in that time, off-site storage units have become a multi-billion dollar industry. A New York Times article from 2009 states that “…by the early ’90s, American families had, on average, twice as many possessions as they did 25 years earlier.” Twice as many possessions? Oh my, I have to declutter something right now just thinking about that! I think the key is to recognize that there’s no “done.” There may be “done” with the big bulk of the decluttering, but like other types of housework, it needs attending to. Interests change. Hobbies come and go. Children grow up, graduate, leave, and maybe come back. There can be the addition of grandchildren or aging relatives. Plus, we apparently have twice as many belongings as our parents did 25 years ago! In my case, Dan’s office is largely untouched. I have some boxes up in the closet in Audra’s bedroom that have never been investigated. The garage is virgin territory. The girls are always maturing and changing, so the belongings in their room need continual attention. The attic is in pretty good shape but surely can stand another culling. Maybe someday I’ll be able to get rid of my Christmas china. In addition, it’s important to be realistic about what’s entering your house. If new things are purchased and nothing is purged, the amount of stuff grows and grows. I had a lighter decluttering month than ususal in October and predict that I will only declutter about 38 things by the end of the month. I have tracked every purchase, and 25 new things have entered my life. Eight of them are brand new, and the rest are second hand goods, so I can feel virtuous from a fiscal and environmental point of view, but it’s still only a net loss of only a dozen items for the whole month. That’s two steps forward and one step back! I’ve written on this topic before and compared the process of decluttering with editing, a past profession of mine. You have to clear off the first layer before you can see the second layer to deal with it. Once you delve into the second layer, there will be a third, and maybe a fourth or fifth. Hard decisions that you put off the first time around need to be addressed again later. The process is a lifestyle change, not a one-time burst of cleaning. That, my dear friends, is how I can have more to declutter. If you get an accessory with something but you don’t use it there is no point in keeping it. Dah! 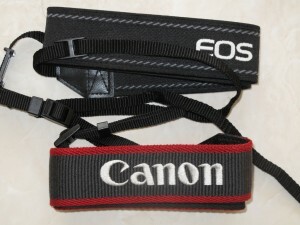 So these camera straps when off the the thrift shop. Goodness knows how long they have been lingering unused in the bottom of the camera bag. I am grateful for the extended warranty on my car. The airconditioner compressor has failed which would have cost me $1400 to replace. Luckily for me it is covered under this warranty. I have been on a 365 delcuttering campaign this year as well. I haven’t blogged on the topic recently, but that doesn’t mean I have stopped. I had a charity pick up NINE bags last week!! I agree we all have way too much stuff. I want to get rid of my china and crystal as we never use them and they really are not my style. I’m just not sure how to sell them or if there is any value to them. I don’t want to give them away as they are Royal Doulton and some Waterford crystal. Congrats Jackie. You’re doing well. Besides Ebay, you can sell china and crystal to the on-line company Replacements. They have an amazing catalog of fine and everyday dishware. My parents were able to buy a couple of replacement pieces for the everyday set they bought in 1963. I thought that was pretty amazing! welcome to 365 Less Things and thank you for dropping in to leave a comment. I took a quick look at your blog and I am going to have to remember Brick Lane for the next time I am in London. We go to a curry place called Soho Spice (in Soho) every time we are there but Brick Lane looks amazing. Thank for that. Well done on your decluttering effort, nine bags that a lot of stuff. And don’t you love it when charities will pick up. I am sure your Royal Doulton and Waterford are well worth selling, they ar both very good well known makers. Start googling to find ideas about where you can get the best money for them. Start with ebay and go from there. Oh boy do I understand! I’ve gone over my house decluttering for the past few months. Then declaring outloud that I have succeeded – only to make another pass through-out the house & find more stuff to declutter. Then I declare yet again that I have triumphed…only to make a third pass & find yet even more stuff to ditch. Round 1 was the big obvious “what the hell was I thinking buying THIS??! !” stuff. Round 2 was the “Well I sold quite a bit rather successfully on Ebay…..hmmm, what else can I unload? ?” stuff. Round 3 was the “Am I reaaalllly gonna wear THAT again? Am I reaalllly gonna use THAT ever?” stuff. I’m about to start on Round 5 – which I suspect will be the “I got waaay too much holiday stuff that I’ve never used/haven’t use in years/don’t plan on ever using” stuff to purge. Which should hold me through the end of the year…but then comes the new year & with that comes a fresh perspective & that can only mean one thing…Round 6! On a side note….cookbooks. I’ve literally gotten rid of ALL my cookbooks. Yes, all of them & I haven’t missed a one. Sold most of them on Ebay as a “lot” sale based on cuisine or author. What I did do prior to selling them off was simple: I took a decent digital photo of the recipe. If the recipe had a photo of the finished product – I took a picture of that too & then set up “recipe” folder on my laptop of my “photographed” recipes. SoI still have the recipes I wanted to keep & even a few that I maybe/might try in the future…but what I don’t have are bulky cookbooks hogging valuable real estate in my house. Same thing with ads, info, web addresses or products I spot in magazines or an unfamiliar product I see in a store or on a marquee. I’ll whip out my iPhone camera & snap a quick photo of whatever it is I want to look at later or learn about or even buy. I didn’t have to write anything down (no pad of paper or pen necessary), I didn’t have to trust my memory (not always so sharp), I didn’t have to tear out a page from a magazine, etc. Your cellphone camera is more valuable than most people realize! I too got rid of all my cookbooks but two. In fact, I intended to write a post about it, and now I’ve gotten another new idea from you. Thank you. Glad you’ve found so many clever uses for your cell phone. I sometimes take pictures of plants that I can’t identify. My mother and I are both big gardeners, and if I don’t know what it is, she surely will. Much more effective than trying to describe a plant (“well, it had small purple flowers on a long stalk….”). Jane, I’m finding that there are many things you can take pictures of and then store the picture on your computer. Another thing that I have found really interesting is Pinterest.com. You go there and join up for free. Then you create virtual bulletin boards where you “pin” the pictures of things you run across that you like. You don’t have to keep them on your computer taking space and others can see them and repin them. You can also go through the pins on Pinterest itself and repin things you find that you like there. I’ve a lot of pins out there of things I might want to get someday, recipes, crafts, etc. Everytime you pin something the link to the website that it contained stays with it. So if a picture is of a craft the instructions can be found by following the link. the same thing with a recipe. I really like it because it saves me a lot of space on my computer and it costs zip. trust me, those layers of clutter go on and on. Judging from what you have done so far I would say that there are at least 10 layers or maybe even more altogether. I did the same as you with my cookbooks except that I scanned mine. And you are so right about phone cameras, they are so handy to make snap shots of things you want to remember. I use mine for that all the time. My neighbor was talking about her virtual bulletin board the other day. I didn’t quite get it, but now, with a second endorsement, I’ll have to check it out. Cindy, you are so right. Decluttering is a lifetime endeavor. For me, I have found that once the BIG purge is over then to keep it that way is what makes it a lifetime thing. Like you said, things change as you change and as you buy. I don’t buy much but I’m very careful to make sure that I don’t start accumulating. RIght now I could use a few more clothes items and wouldn’t have to get rid of anything but if I get more than two or three things then I would. My mom says I’m “lean and mean” with my possessions. Grin. Good for you Ms. Lean and Mean. I was surprised to find how much I’d purchased v. getting rid of this month. True, a lot of it was due to the garage sale, and also true that I usually get rid of more than 1 thing a day, but I’m going to track next month, too. I don’t want to go one step forward and half a step back on a monthly basis! I need to keep track of the ins and outs. I buy so little that my ins are pretty low. I did buy several books on Saturday. I have a small collection of Christmas books by this one author. I have been missing several because I won’t pay the list price for them. then I found them on Amazon for the big prices of 74 cents, 86 cents and $1.25. I had to get them at that price. Just today I got rid of something. We buy cashews in a big clear container and when it is empty we wash it up and give it to a friend who uses it for storage of scrapbook or sewing supplies. I gave one to her today. She’s a happy camper and so am I.
I struggle with decluttering things like camera straps. I don’t know if it is because they are part of an expensive item or what. I REALLY need to get ruthless and throw a bunch out!!! I just read it over. By now, I have gotten rid of BOTH pieces of the coffee table set, and the guinea pig ramp and platform, but I still have all the parts of the food processor. Sorry, no great advice here from me. Maybe Colleen, the ruthless camera strap disposal lady, will have some wisdom. I notice you haven’t commented here before so let me say welcome to 365 Less Things and thank you for dropping in to leave a comment. As for the problem with splitting things to declutter, for me i suppose it depends on what it is. The iRobot accessories I decluttered last week could have been sold with the rest of the original vacuum cleaner but that would have meant some awkward boxing up so I sold them separately and made an extra $20. A camera strap comes with pretty much every camera you buy so as cameras come and go they start to build up. Usually by the time you sell and old one after an upgrade the strap is forgotten and doesn’t go with the camera so the thrift store seems like a logical place to dispose of it. I bought a new stick blender this year because my old one died after all the hard work blending food for my son while he had a broken jaw. I chose between two packages one had less accessories (but not the right ones for me) while the other had lots of accessories (too many for me) and wasn’t much more expensive. I chose the large package and am now trying to sell off the extra parts I don’t want on ebay. There may be someone out there who made the oposite choice to me who might want an extra accessory. I gave away the top portion of my entertainment unit to a carpenter who planned to deconstruct it and use all the parts. There is always someone out there who wants this or that and if I am getting good use out of part of one thing and know I will likely wear it out I have no problem finding a new home for the other section/pieces. A message to Sharon: Last week you said that you “hoped” to follow in mine and Colleen’s footsteps, and I told you not to HOPE but to DO. What did you declutter this week? I want to know. Yup, decluttering is a journey NOT a destination with a final calling place!! I will never be done, rest on your laurels and your house will fill back up again, trust me i know…. Good job Sharron. I like your insy-outsy list. For the first year I tracked every single thing that I got rid of; now I just record the number for the month and the amount of money I made. However, tracking what I buy could be a new dimension for me. I was just thinking the same thing about my own place this past week. As someone who lives a minimalist lifestyle in a very small apartment, I wonder how do I accumulate all this STUFF?? Oh heck, just because I got there a few days ahead of you doesn’t mean you can write about it too Mark, I’m sure you’ll have a somewhat different take. One further item l am glad l have decluttered is a beautiful set of Mikasa wine goblets. They are seriously stunning but have not been used since l got them as a gift over 11 years ago……yes…..they were sitting in the original box! Fantastic to give your wine glasses to an eager recipient. I often ask friends and neighbors before I get rid of stuff. Hi Cindy, I understand completely. I look at it this way. It took me over 40 years to accumulate all my stuff. It’s probably going to take me several years to declutter it. I don’t think two (total!) nighties is too much of a splurge Ann. Sounds like you stuck with useful items. Funny, Cindy, a year ago, I wouldn’t have thought twice about bringing that lot in, and probably more besides. The “declutterbug” must have settled right in! I know I still lots to declutter. The majority is ‘hidden’ in cupboards and closets so it isn’t noticeable to the naked eye. BUT. I know it’s there burdening me down. A few years ago, I decluttered more than half my cookbooks. Mostly, what I have left are the ones I use (semi) regularly. Colleen, I’m totally going to steal that quote by Brother David Steindl-Rast for my FFF this week. It’s great. Hi Willow, I was just thinking about you and Meg yesterday. Seems like it’s been a while since I’ve seen a comment from either of you. Glad you’re still around and decluttering. Willow still drops in fairly regularly but we haven’t heard from Meg in ages. I must check her blog to see how she is doing. I’m reading regularly just not always commenting. Reading and correcting 44 compositions every week seriously cuts into my play time. Hi Willow, I don’t know how you keep up with it all. Liam has just handed in a 3500 word essay for the end of his 2nd year of uni, multiply that by whatever number of students and I seriously don’t know how the lecturer manages to grade it all. Better them than me is all I can say. I love the comments from Jane, it’s like a boxing match, I’m probably up to round 9, I do believe it never stops. Since my initial purge, way back when? I have always been able to get rid of bits here and there so it really is manageable once you have started. I like the momentum of decluttering, it just starts to flow (once you have made up your mind). A while back my beautiful friend was venting about her girls having no room so I suggested she have a clean up and that I was willing to help her, OMG! I should have stayed in bed! haha We had a good laugh though, she has 3 daughters and she is not the most motivated housekeeper (Bless her Princess Cotton Socks!) so you can imagine the dilemma! Eventually we had managed to bag up heaps of clothes, bits & bobs and a huge amount of toys to be given to her nieces & friends. I truly had to laugh when she declared herself ‘DONE’ in fact after having a cuppa and still sniggering to myself, she started spotting things as she wandered around without breaking her toes or falling over. So started her ‘Boxing Match’. I finally relented to going shopping with her because it was plain to see that by the end? of the declutter the things left really needed a home. So we had a day of searching and planning for the best solution and as I kept her on a strict size budget she couldn’t go mad and get a huge big unit that would only house more junk! We narrowed it down to a couple and she went home with a good plan! I went home with $4.00 worth of Ikea brown paper bags. 5 for me to fill with bits as I was finding them, 15 for my friend to present to her girls to fill. (coz I just knew they’d find more stuff!) They have actually turned out to be quite ruthless once they started sorting so I’m hoping that mindset will stay. After their ‘Round 3 or 4’ she went to Ikea with her girls and she purchased the small Expedit Unit, the girls agreed that they could all use it for their goodies that were staying. Man sometimes you just have to buy something to achieve something, thankfully the unit was all she bought. Everytime I am there I can see the layers being peeled back one by one, slowly, slowly, I love it and I have a competition going between the girls who can keep the best room, I also challenge them as to who can find the most of their gear that has migrated out of their rooms and return it, it’s amazing how persuasive a chocolate frog can be LOL!! and good old fashioned praise too! 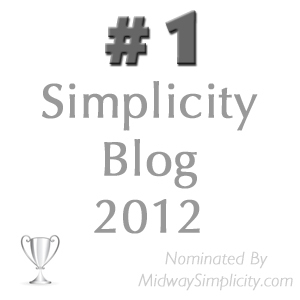 I just hopped over to Jackie’s blog & wow, really cool! I also noticed this on her photo’s …..
there’s something in that for all of us! It was a billboard advertisement on a highway that Jackie has photographed. Take a look at her blog if you haven’t already it is very cool & yummy looking food! Thanks Jackie. I have just been clearing off the patio and found 5 things to dispose of in whichever way seems fit for the thing. 5 THINGS, I just swept it yesterday and today I found 5 THINGS. Cindy is soooo right, there will always be something to de-clutter!! I agree with OMG to 911 but my brother has a auto smash repair business and he finds the GPSs cause more accidents than cell phones, do you think they will ever ban those, I bet not. Actually I hope not I love my GPS but taling ones are safer than the phone ap ones that you have to constantly look at. Hi – I am on month 6 and round 4 of de-cluttering – loving it! Before my husband and I bought our first house, we and our baby son rented. The problem is that we live in a tourist town and during the summer you’d be moved on for holiday makers paying higher rents, and to secure the next house often the landlord would ask you to move in that day to avoid squatters or break ins. Each shift we ditched more stuff – granted there was only 3 of us and we didn’t have a huge amount of stuff. After several shifts, with the aid of bro-in-law, we could move & unpack within FOUR hours. Then we bought our first house, two more kids, nine years later it took us THREE days to shift and unpack and that was with about 9 or 10 friends helping. That’s too much stuff, its just crazy! So my goal is that if we had to shift we could do it in six hours. There are 5 of us, and bound to have a couple of friends for heavy lifting. My kids are teens (we’ve been in current house 6 years, accummulating on top of the accummulation that we shifted in with) so as far as I’m concerned it is a viable goal to work towards. I don’t have China or Crystal, just glasswear and crockery. My vases are stored in their original boxes in their cupboard in the dresser. That’s about the extent of things that are breakable. I’m sure my husband would lovingly wrap the big screen tv in blankets and personally carry it to its next destination. My friends and kids think I’m crazy – does any one else think its realistic or unrealistic? I feel I am among kindred spirits on this forum but am not sure I am going too far with my ultimate goal. One of my workmates and his wife plus child – she’s a minimalist (her story is really interesting – it is her work background that made her a minimalist) and they shifted easily within 4 hours. Hi Moni, welcome to 365 Less things and I say go for it. There is no such thing as owning too few possessions. If you can get by with enough stuff that will only take six hours to move then good for you. This question just goes to show how normal it is these days to own far more than what we need. I would like to think that the next time my family moves we are going to need about 1/3 of the packing boxes we filled for our last move. Thanks for the encouragement Colleen – am at the point where heaps of stuff has been dumped, and heaps of stuff has gone to recycling/charity bins. I’m now at the point where I’m listing on auction sites stuff that is too valuable to throw out. Now I know that organised clutter is still clutter, but I’m suprised how down it has made me feel having stuff out all over the place again. Am packing it into laundry baskets or plastic bins after its been photographed and listed, but it is suprising how tempted I am to skip onto the next project and leave it all there. It is almost like instant gratification to see things going out quickly. Did anyone else feel like that at this point of things? And could you tell me about the in/out journal? I haven’t heard of that before, seems a more advanced technique. I think I will respond to your comment as a post tomorrow. I also find selling my stuff irritating at times too and have written about it often. If you go to the Tag Cloud in the right margin of my blog page and click on ebay you will find plenty to read on the subject. But tune in tomorrow and you can read the latest. Colleen, I take it all back about online auctions. It is what you list that makes the difference. I am a ballet mum (and that’s declutter challenge all of its own) and those items despite loads of descriptions and measurements, it is a slow, question asking, wait to the last minute to bid auction. (I had one lady ask me to count the number of sequins on something). I listed all the dirt bike gear dating back 5-6 years – and it was a feeding frenzy. All but 3 of the 20 items sold within 36 hours at the higher buynow price. And now I can’t get it out the door fast enough. Don’t take this wrong ladies, but the dirt bike blokes get 5 stars, hands down, but then I guess guys have more of get-in-and-get-out approach to shopping. You are so right Moni, it is all about what you are selling. The problem is you never know how popular it is going to be until you list it. My husband sold a kick start for a Ducati motorbike for $1200 once. I will list the same things three times before I give up and sometimes in the third try I will get multiple bidders.